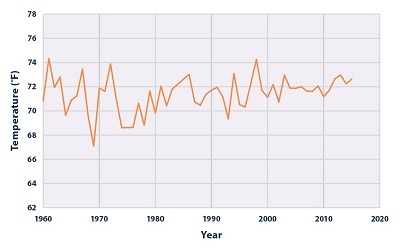 ﻿ Fun Easy English - Environment - Global warming - Climate change Indicators: Trends in Stream Temperature in the Snake River. Climate change has challenged and will continue to challenge some of the traditional ways of life that have sustained indigenous peoples for thousands of years. In the Pacific Northwest, warming river and stream temperatures will threaten ecosystems and species, including salmon populations. Salmon play a particularly important role in the diet, culture, religion, and economy of Native Americans in this region. Salmon are sensitive to water temperature at many stages of their lives. They spend much of their adult lives in the ocean, then migrate inland to spawn. Salmon need cold water to migrate and for their young to hatch and grow successfully. 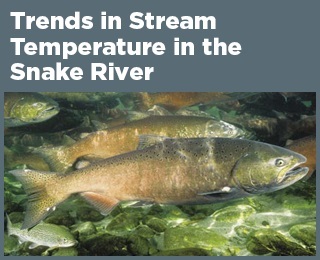 Warmer water can negatively affect fish, making it more difficult for them to swim upstream. It can also make fish more susceptible to disease. River and stream temperatures in the Pacific Northwest are influenced by many factors, but are expected to rise as average air temperatures increase (see the U.S. and Global Temperature indicator).